Now in it’s 28th year, the music festival with humble beginnings that otherworldly American musician Arthel “Doc” Watson created in 1988 to honor his son Eddy Merle Watson, tucked into the Blue Ridge Mountains of Wilkesboro, North Carolina, is known around the globe these days for world-class music, memories, community and discovery. There’s a magical experience in seeing or discovering a band for the first time, or even seeing a favorite artist or group again and again – and sharing the experience with tens of thousands of your newest friends – a euphoric feeling that’s almost too good to be true. Yet that feeling is reality, and fortunately it’s happening again this week in those familiar Carolina foothills. Within the leafy campus of Wilkes Community College, this year’s MerleFest brings forth headliners Dwight Yoakam, The Avett Brothers, Trampled by Turtles, Marshall Tucker Band, Bela Fleck and Abigail Washburn, Lee Ann Womack, Del McCoury, Robert Earl Keen and Jerry Douglas and his Earls of Leicester, with scores of familiar faces such as festival vets Sam Bush, Jim Lauderdale, Peter Rowan, Chatham County Line, The Black Lillies, Steep Canyon Rangers, David Holt, Bryan Sutton, T. Michael Coleman, The Honeycutters, Scythian, and many more artists from the ‘traditional-plus’ genres of music – designated by Watson as the traditional Appalachian music and the other genres close to his heart – more often than not, roots, folk, country and Americana. One of the many hallmarks of the festival is the open and inviting atmosphere. Throughout the weekend, it’s not unusual to see artists walking the festival grounds, talking with fans and catching up with fellow musicians, family, and friends. Unlike numerous festivals, festivalgoers at MerleFest are studied music fans, many who are musicians themselves. There is a shared experience amongst those in attendance of discussing performances from the 80 artists performing across 13 stages over the weekend, as well as the announced – and rumored – collaborations and songs, even the instruments being played during the multitudes of sets throughout the festival’s four days. There is plenty of reminiscing, as one may imagine. Another MerleFest calling card is that the quality of the music is second-to-none. The ‘traditional-plus’ lineup of music genres renowned at MerleFest is as much a trademark of the festival as Doc Watson himself. After talking with Doc about planning for the future of the festival, Hagaman says the traditional-plus theme remains stronger than ever, even almost three years after Watson’s untimely passing in May of 2012. “We have a formula that we developed about 25 years ago, when the festival really started becoming an annual festival,” says Hagaman. “It’s kind of like Kentucky Fried [Chicken’s] secret recipe,” Hagaman continues, laughing, “of the number of different types of acts that we bring into MerleFest – that includes everything from bluegrass to Americana to Celtic to country to rock, and it goes on and on and on. We’ve stuck with that recipe, and we continue to stick with that recipe. Renowned bassist T. Michael Coleman, a longtime collaborator with both Doc and Merle, agrees about the strong familial and community aspect that is the backbone of the festival. There are few, if any, better resources on the festival than Coleman, who has only missed one MerleFest to date – in 1988. Of all the 80 acts performing throughout the weekend, who is Hagaman most looking forward to seeing? “All of the above,” Hagaman says with a jovial laugh, for a moment toeing the company line, before admitting to a few acts he’s planning on catching. “Naturally, we’re always thrilled to have The Avett Brothers here – that goes without speaking. Dwight Yoakam, we’ve had him on our list for two or three years, and it worked out this year. We’re tickled about that. Along with Coleman, for several of the artists performing again at this year’s MerleFest, multi-instrumentalist/vocalist Tara Nevins of Donna The Buffalo, multi-instrumentalist Danylo Fedoryka of Scythian, and vocalist/guitarist Amanda Anne Platt of The Honeycutters, the festival marks a special place in their band’s touring schedules, as well as their band’s careers. “We love MerleFest,” Nevins, co-founding member of the NY-based Americana roots rock veterans Donna The Buffalo, says, “and have been playing there for years. It’s an integral part of our year. We look forward to it. For me, it’s a wonderful festival to play and we look forward to seeing all the wonderful people we’ve met sharing the weekend and sharing our music. It’s always a great time. We run into wonderful friends and wonderful people – we’re always treated really well there. As for Amanda Anne Platt, her time at MerleFest this year is much like her band The Honeycutters’ musical themes – optimism and hope mixed with equal parts heartbreak. The vocalist/guitarist of the Asheville, NC-based country roots act is admittedly sad at missing out on seeing a certain country icon who happens to be headlining on Sunday this year. As a successful band leader and singer-songwriter, Platt’s first experience with the festival came by way of songwriting contests she entered early in her musical career. Along with her talent in writing authentic and emotions-on-her-sleeves country roots tunes, her persistence led her to MerleFest, landing her a spot in the festival’s Chris Austin Songwriting Contest, named in honor of the country/bluegrass songwriter. “I’d never heard of [MerleFest] before I moved to Asheville,” Platt admits. “The way I started being interested in it was I was submitting to a lot of different songwriting contests, and the Chris Austin [Songwriting Contest] was one that came up on my radar. I submitted to it two or three years before I was a finalist. It really became this epic destination in my mind,” she continues, adding a laugh, “‘I’m gonna get into the Chris Austin Songwriting Contest – I’m gonna get it!’ So when we finally got to go, it was a really cool experience. Tributes and collaborations are also an integral occurrence of MerleFest. This year, Coleman will be sharing the stage with numerous artists in remembering Doc and Merle. For Coleman, he cherishes the role of musician and storyteller. “It’s very rewarding to be given that responsibility of relating the memory of Doc and Merle, but the thing that I wanted to do, is to make sure that the audience does not forget why this festival is. It’s because of Doc and Merle and the music and the joy that they brought. To be given that responsibility, is an awesome responsibility and a very humbling experience. Throughout the 1970s and 1980s, Coleman played bass alongside Doc and Merle, before venturing into famous progressive bluegrass/folk outfits the Seldom Scene and Chesapeake. Playing in such storied company as the Watson father and son was special, even for such a talented musician as Coleman. There’s a lasting memory about Doc and Merle that Coleman keeps with him everywhere he goes. “Doc and Merle would always do the right thing,” Coleman admits. “Money made no difference, time meant no difference – they would always do the right thing. That’s something I try to carry forward. Coleman says he cherishes catching up with friends over the happenings in one another’s lives – providing just as lively a backdrop as the music. 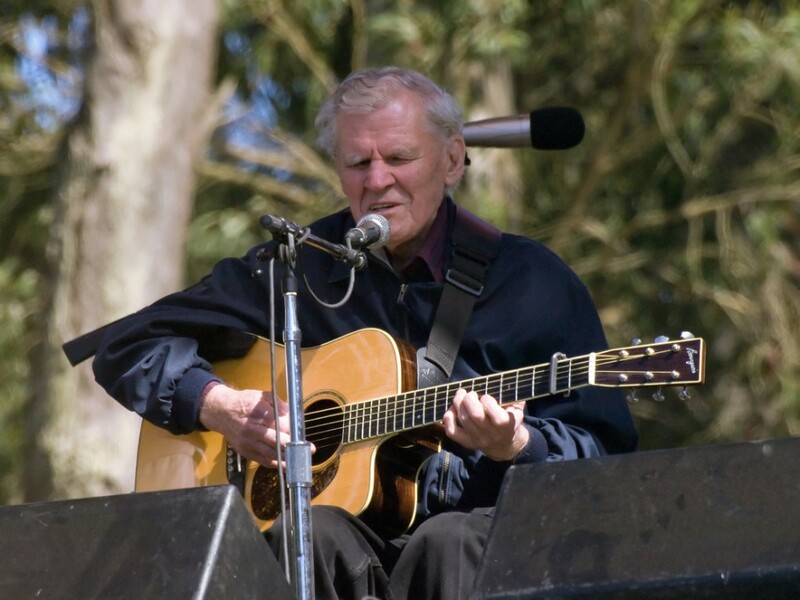 Another year of MerleFest is upon us, and Doc Watson’s envisioned circle of music and memories remains unbroken. MerleFest 2015 runs from April 23-26 on the campus of Wilkes Community College in Wilkesboro, NC. Visit www.merlefest.org for more details.